After leaving the Roswell, NM area we drove 74 miles south to stay in the SKP Co-Op named "The Ranch" (near Lakewood, NM) for the following week. Our goal was to make the 40-mile drive each way to visit the Carlsbad Caverns National Park. There truly is not a whole lot near the SKP Co-Op, but it made for a good base of operations to catch up on a few needed activities in the rig, and to visit the National Park. We found out that after Labor Day, the number of visitors greatly decreases, and the NPS takes the opportunity to do routine maintenance on the elevator systems which normally would transport people from the surface down to the start of the tours (about 800 feet in elevation). The only way to take the tours while we visited was to walk the Natural Entrance Trail (about 1.25 mile each way) and the aforementioned 800 foot drop. Going down isn't bad, but I'll be the first to admit that we took several breaks along the trail out. If you visit the Caverns when the elevators are working, I would still recommend taking the Natural Entrance Trail at least one time. You get a true feeling for what it was like for the original explorer to drop deeper into the earth. Plus, the formations are amazing. Here's a view as we descend the trail. The NPS has done a nice job of lighting the trail to direct the eye to formations that you might miss in the dim light. The meeting place for the tours is just past the elevators, near the small cafe. After a short safety briefing (meaning keep your hands off of the formations and walls) our group was guided into the King's Palace. We were told that in the early 1900s, groups would descend up to 5 hours to have dinner parties in King's Palace. Then they would make the 5 hour ascent back to the entrance. The paved path leading down from the Natural Entrance to the start of the tours area was not put in place until the 1950s, and was again upgraded in the 1970s. Some of the living formations in the King's Palace Tour included these paper thin valences. After completing the King's Palace Tour (which is ranger-led), we set out to explore The Big Room Trail (which is self-guided). This trail is about 1.25 miles in length and takes about 1.5 hours to fully appreciate the formations. This formation was called The Lion's Tail. I could see that. Beautiful formations at every turn. This was the type of ladder that Jim White, the 16 year old boy, constructed to enter the depths of the cave in 1898. I'm really trying to limit the length of the blog by only showing a small number of pics we took while underground. Be sure and click on the links at the beginning of the blog to see more. We returned on September 20th to take the second ranger-guided tour named Left Hand Turn. This tour is limited to 15 visits at one time. I believe we had 9 people. This tour is a bit different in that it attempts to show a less traveled area (and the only light throughout is provided by the lanterns carried by the guests on the tour). This is the very beginning of the trail where lighting is still provided. The trail is an out-and-back. During the first half, no photography is allowed to enhance the "exploring" feeling. This is a picture of our group on the way back out. Here's a small pool along the trail. Notice the small black flecks in the water? Bat guano. At the halfway point, the Ranger had us all take a seat on the ground and blow out all of our lanterns to experience the cave. This is exactly what you could see of your hand directly in front of your face. Both of the tours we took were excellent and the Rangers leading the tours were very knowledgeable. The number of visitors down in the caverns this time of the year were few. A perfect time to visit! Before leaving on the 20th we wanted to witness the Bat Flight Program. 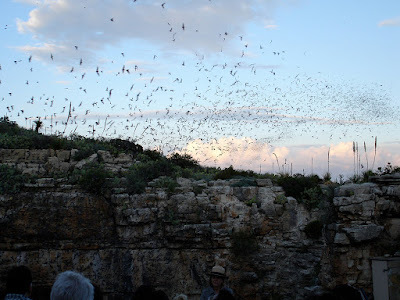 This time of the year from May until mid-October hundreds of thousands of Mexican and Brazilian Free Tail bats exit from the Natural Entrance each evening in search of food. They again return to the cave about 5:30 to 6:00 each morning. These bats will travel up to 100 miles each evening in the search for food. They have a huge appetite for mosquitoes. Unfortunately, while the bats are flying no electronic devices of any type are allowed to be used. The visit to Carlsbad Caverns National Park was one of the highlights of our summer visits. We thoroughly enjoyed our time down in the Caverns and hope to someday return to take some of the other tours available to the public. Our next move, after a short one-night stopover in Deming, NM is to Benson, AZ where we'll visit Kartchner Caverns State Park. Paul, as I wrote, this was one of the coolest places we visited this summer. Will definitely return someday. I'm trying to catch up on my blog reading.... so behind lol. Enjoyed your posts on NM. We've discovered so many hidden gems in this state with many more to explore. Hope to bump into you guys one day! We should be "on the move" again in a few weeks. Hopefully, I'll get back into the posting of blogs on a regular basis again.